Leather * Heated Seats * Navigation * Backup Camera * Alloy Wheels * Towing Package * Bluetooth Wireless * UConnect * Thank you for visiting another one of Apollo Auto Sales 's online listings! Please continue for more information on this 2012 Ram 1500 Laramie with 128,595mi. Opulent refinements married with exceptional engineering make this the kind of car you'll want to own for a lifetime. No matter the terrain or weather, you'll drive at ease in this 4WD-equipped vehicle. With exceptional safety features and superb handling, this 4WD was engineered with excellence in mind. More information about the 2012 Ram 1500: The Ram stands out compared to other full-size pickups because of its well-engineered coil-spring rear suspension system, which allows a smoother ride compared to pickups with leaf springs, while permitting hauling and towing ratings comparable to those rival models. Its Hemi V8 engine is also one of the strongest options for half-ton truck shoppers, and it returns up to 20 mpg. Chrysler says that the Ram 1500 is the first truck in its segment to offer a solution known as the RamBox, that offers flexible storage bed-side--including a removable liner--and that it's the first truck in this class with available surround-sound audio. R/T models, with their Hemi V8 and shorter axle ratio, are also among the quickest pickups, with 0-60 mph in 6.1 seconds. Also, according to Chrysler, the new Ram 1500 Tradesman HD tops all other half-ton pickups with its trailer and payload ratings. 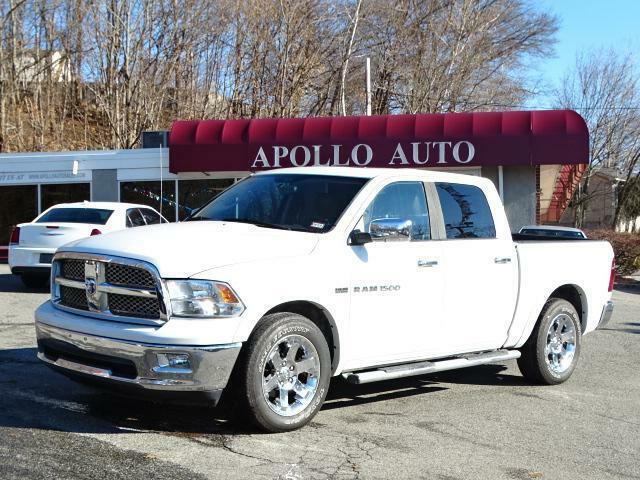 Interesting features of this model are full luxury interior in upper trims, coil-spring rear suspension for a better ride, stylish, macho appearance, Strong Hemi V8, and innovative RamBox bed-side storage Apollo Auto Sales has been in Business Since 1972. We Specialize in Late Model-Low Mileage-Fully Serviced Vehicles. Apollo Auto Sales practices a Velocity Based Pricing Strategy which provides a Transparent Sales Process and Excellent Overall Customer Experience. Please Call Us to Check Availability and to Schedule your No Hassle-No Obligation Test Drive!! Call 401-728-8998 or Click: www.apolloautosales.com.